The year 2020 is crucially important for another reason, one that has more to do with physics than politics. When it comes to climate, timing is everything. According to an April report1(prepared by Carbon Tracker in London, the Climate Action Tracker consortium, the Potsdam Institute for Climate Impact Research in Germany and Yale University in New Haven, Connecticut), should emissions continue to rise beyond 2020, or even remain level, the temperature goals set in Paris become almost unattainable. The UN Sustainable Development Goals that were agreed in 2015 would also be at grave risk. That’s why we launched Mission 2020 - a collaborative campaign to raise ambition and action across key sectors to bend the greenhouse-gas emissions curve downwards by 2020 (www.mission2020.global). After roughly 1°C of global warming driven by human activity, ice sheets in Greenland and Antarctica are already losing mass at an increasing rate. Summer sea ice is disappearing in the Arctic and coral reefs are dying from heat stress - entire ecosystems are starting to collapse. The social impacts of climate change from intensified heatwaves, droughts and sea-level rise are inexorable and affect the poorest and weakest first. 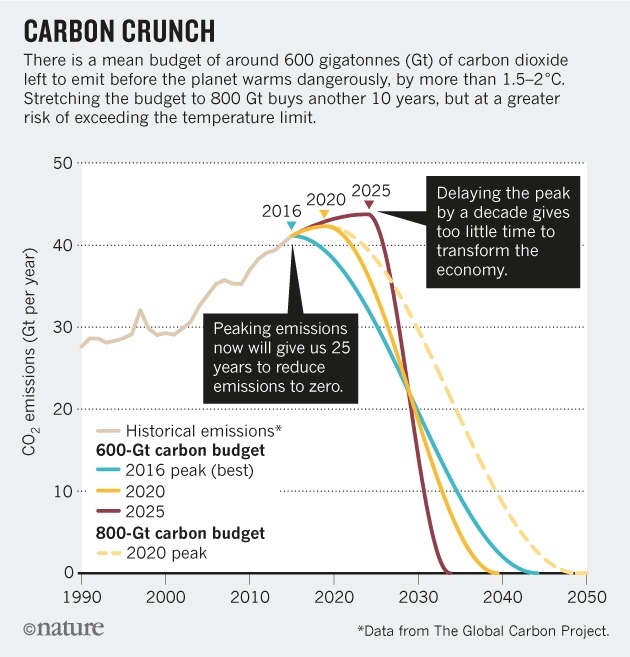 The magnitude of the challenge can be grasped by computing a budget for CO2 emissions - the maximum amount of the gas that can be released before the temperature limit is breached. After subtracting past emissions, humanity is left with a ‘carbon credit’ of between 150 and 1,050 gigatonnes (Gt; one Gt is 1 × 109 tonnes) of CO2 to meet the Paris target of 1.5 °C or well below 2 °C (see go.nature.com/2rytztf). The wide range reflects different ways of calculating the budgets using the most recent figures. Greenhouse-gas emissions are already decoupling from production and consumption. For the past three years, worldwide CO2 emissions from fossil fuels have stayed flat, while the global economy and the gross domestic product (GDP) of major developed and developing nations have grown by at least 3.1% per year (see go.nature.com/2rthjje). This is only the fourth occasion in the past 40 years on which emission levels have stagnated or fallen. The previous three instances - in the early 1980s, 1992 and 2009 - were associated with global economic predicaments, but the current one is not2. The International Energy Agency (IEA) has predicted that, by 2020, renewable sources could deliver 26-27% of the world’s electricity needs, compared with 23.7% of electric power at the end of 2015. But that underestimates the pace of change in energy systems. Growth in electric vehicles alone could displace 2 million barrels of oil per day by 2025, according to a February report4. It suggests that, by 2050, this could reach 25 million barrels of oil per day - a stark contrast to expectations from the fossil-fuel industry that demand for oil will rise. And solar power alone could supply 29% of global electricity generation by 2050. This would remove the need for coal and leave natural gas with only a 1% market share. However, the oil firm ExxonMobil predicts that all renewables will supply just 11% of global power generation by 2040 (ref. 4). Investors, meanwhile, are growing wary of carbon risks. BlackRock and Vanguard, the two largest fund managers, voted - along with many others - against ExxonMobil management at its annual general meeting on 31 May and instructed the company to report on the profit impact of global measures to keep climate change below 2 °C. Earlier this month, Norway’s US$960-billion sovereign-wealth fund declared that it will ask the banks in which it has invested to disclose how their lending contributes to global greenhouse-gas emissions. There is a strong headwind against the low-carbon transition in some places, which may impede progress. For example, the Financial CHOICE Act - a bill passed by the US House of Representatives on 8 June - would make it nearly impossible for investors to challenge companies on climate-risk disclosure through shareholder proposal processes, as at ExxonMobil. However, as the UN Secretary General, António Guterres, said in New York last month: “The sustainability train has left the station.” The fossil-free economy is already profitable6 and creating jobs (www.clean200.org). A report this year by the International Renewable Energy Agency and the IEA shows that efforts to stop climate change could boost the global economy by $19 trillion7. The IEA has also said that implementing the Paris agreement will unlock $13.5 trillion or more before 2050. Recent geopolitical events, too, have galvanized activity in support of the Paris agreement. For example, the #WeAreStillIn campaign - involving more than 1,000 governors, mayors, businesses, investors and universities from across the United States - has declared that it will ensure the nation remains a leader in reducing carbon emissions. Energy. Renewables make up at least 30% of the world’s electricity supply - up from 23.7% in 2015 (ref. 8). No coal-fired power plants are approved beyond 2020, and all existing ones are being retired. Industry. Heavy industry is developing and publishing plans for increasing efficiencies and cutting emissions, with a goal of halving emissions well before 2050. Carbon-intensive industries - such as iron and steel, cement, chemicals, and oil and gas - currently emit more than one-fifth of the world’s CO2, excluding their electricity and heat demands. The fossil-free economy is already profitable. International Energy Agency. World Energy Outlook 2016 (International Energy Agency, 2016). WindEurope. Wind in Power: 2016 European Statistics (WindEurope, 2017). Carbon Tracker. Expect the Unexpected (Carbon Tracker, 2017). IRENA. Renewable Energy and Jobs: Annual Review 2017 (IRENA, 2017). IEA/IRENA. Perspectives for the Energy Transition (IEA/IRENA, 2017). REN21. Renewables 2016: Global Status Report (REN21, 2016).